When viewed over many years from above, stream channels without beavers meander back and forth across the valley, writhing like a snake. This channel migration occurs because moving water mobilizes soils and causes erosion. In addition to lateral movement, these channels cut deeper and deeper into the ground. Deep valleys or canyons can result. Eventually once lush stream corridors can lose most of their plant and animal life. However, beaver dams reverse this damaging erosion process. How? By simply slowing water flow. The impounded water behind a beaver dam drops its sediment which raises the stream bed. This raises both the surface water level and the surrounding underground water table. As underground moisture rises, it becomes available to plant roots. Once lush vegetation returns, insects and animals do too. The beaver pond is a magnet for multitudes of species which is why beavers are a Keystone species. Unfortunately colonial unrestricted trapping combined with the scorched earth policy of the Hudson Bay Company 200 years ago left most of our streams without beavers. In the absence of beavers many streams became deeply incised due to erosion, with steep embankments and devoid of vegetation for beaver food and building materials. These badly damaged streams are inhospitable to beavers. Severely damaged streams are where man, once the initiator of this destruction, is becoming an agent for positive change and restoration. 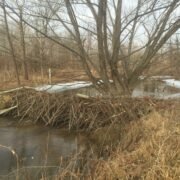 Beaver Dam Analogues (BDA’s) have been shown to reverse severe stream incision by mimicking natural beaver dams. These man made wooden structures slow the water and allow sediment deposition to begin. Eventually enough sediment is deposited for the stream to reconnect to the floodplain. Then the area becomes inhabitable for beavers who will build their own dams to finish the restoration work. Widespread watershed degradation across North America was largely due to man’s greed and shortsightedness by removing beavers from the landscape. Fortunately we humans have the ability to learn from our mistakes and even correct them sometimes. BDA”s and progressive beaver management is the cure for our predecessors mistakes. Embracing BDA’s and progressive beaver management will help restore our waterways to the to the healthy ecosystems they need to be. Plus, beavers do the stream restoration work for free naturally! If you would like to comment or share your own story please go to our Beaver Institute FB page.